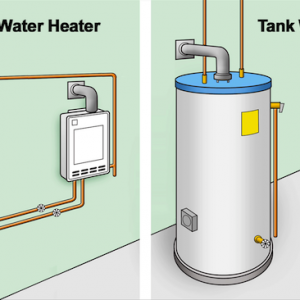 How Much Does It Cost To Install A Tankless Water Heater? The average cost to install a tankless water heater is $1,782. Homeowners find themselves spending between $959 and $2,739, depending on the model and factors like labor. The typical hourly rate for a plumber is $45-$150. Conventional hot water tanks may become a thing of the past considering all the modern-day advances now available. With the innovation of the tankless style, consumers are promised a quick and abundant supply of hot water anytime they need it. Are the cost and space savings beneficial enough for consumers to make the change? These units have the potential to save you money in the long-run if they are installed and connected correctly. To make the most of your investment and ensure the equipment operates at its highest capacity, hire a professional. They will have the experience necessary to both expedite and guarantee proper installation. The most influential cost factors are labor and the type of heating equipment you choose. Consumers who hire a professional can expect to pay either an hourly fee or a flat fee. The average hourly rate for a plumber is $45-150 per hour. Final labor totals about $100-$450. Consumers will also need to calculate material and labor for necessary parts. The accessories needed typically include a termination vent kit, gas connector kit, two-piece lead-free brass valve set, along with fittings and mounting hardware. Vent kits cost $40-$100 and insulation and piping averages $10 per foot. Other cost factors include removal and disposal of the current heating system, any necessary electrical updates, added insulation, and possible structural modifications to accommodate the new unit. Your total project cost will vary depending on the type of equipment chosen and the professional who performs the work. Single point electric units cost around $150 each, while a high-end gas model for the whole house could be over $1,000. Understanding what type of unit you need is the first step. For example, a Noritz gas tankless unit of 199,000 BTUs is sufficient for an average household with several bathrooms. Factors such as proper ventilation to prevent carbon monoxide poisoning and changing the size of gas lines and fittings will take an average of 10 hours. So, labor costs may run higher for these models. For consumers with low demand, there are less labor-intensive models on the market. An electric, point-of-use model can be installed under the sink by a plumber with electrical skills. For this type, you’ll need an electrical timer and outlet as well as supply lines. It takes about two hours to install, so consumers can save on installation. You can adapt your system to your budget according to your needs. The options listed below could save you money either up-front or long-term. If it makes more sense for your home, choose a boiler instead of tankless unit or install a single point system rather than a whole-house system. You can also invest in a tankless unit that qualifies for a tax credit to boost your ROI. Hot water heaters were around long before tankless ones. They are commonly referred to as boilers. These units are used for central heating and can also heat the water for your home using steam. High-efficiency boilers are priced at $3,000-$7,000. This is partially because the labor will be more involved. This is significantly more expensive than tankless models, and boilers take up a lot more room by comparison. The benefit, however, is that a hot water heater is one of the most efficient options on the market. There is also the chance that your home is already outfitted with a boiler, which can be modified using an indirect system. Single point, or point of use, tankless systems are placed specifically by and for individual appliances and faucets that need them. They are relatively easy to install and cost $100-$200 each. They will be more efficient than using one for the whole house, as the water only travels a short distance and less goes to waste. These single point systems can be useful in homes with multiple bathrooms and appliances, as they operate independently of each other. However, and average-size with regular usage throughout the day will function well on one whole-house unit. Another factor that will affect costs is a reduction offered on solar-powered equipment. The government offers a 30% tax credit on the cost of installation for solar water heats. Find out more about the solar tax credit via Energy Star. In the past, consumers could take advantage of a tax credit on products that qualified with Energy Star. Tankless heaters that had the Energy Star symbol were considered energy-efficient appliances by government standards. Learn more about the expired tax credit via the Department of Energy. Gas or Electric Tankless Water Heater? Natural gas and propane styles cost an average of $1,000-$1,500 to install. While these two forms of gas will fuel your system in much the same way, there are some distinct differences in acquisition and operating cost. Natural gas will rely upon a utility supply line while propane will need to be purchased independently. If you live within a certain distance of a natural gas line, you may even be required to use it. For most homeowners, this isn’t a problem. Natural gas is the less expensive option, costing an average of $200 per year versus the average $350 per year to run a heater on propane. Propane is a cleaner and more efficient fuel, however, with a higher BTU than natural gas. Gas tankless styles are widely available in a large variety of models and sizes. They also range in output from 140,000 BTUs to 380,000 BTUs and are available in residential and commercial grades. If a natural gas line is made available in your area, be sure to check that your appliances can be converted before making the switch. Electric models are less expensive than gas ones and are an average of $800-$1,500 to install. The installation work required is not as complicated when compared to gas models because there is no need to vent. They are also easier to maintain, perform very well, and produce high energy ratings. The tankless electric unit is more efficient that one with a tank by 20%-30% and emits zero greenhouse gases. These units require more energy than gas ones, however, and you may need to hire an electrician to rewrite your home for one. Electricians typically charge $50-$100 per hour. Electric Hybrid Water Heaters – These are initially expensive but heat faster than standard, electric models. Though they are not considered tankless, they share many elements of a tankless system: they do not need ventilation and are very economical. However, they are only available in models up to 8,700 BTUs. Point-of-Use Electric Models – $100-$200 each – These offer a lot of attractive features such as the low price of the product affordability, and ease of installation. They are also very convenient to use under sinks in small areas, and even near washing machines. This is an excellent option for people who need small units for campers, boats, and small bathrooms. They are non-corrosive, insulated, attractive, and lightweight. They help save water by conveniently heating it and providing it quickly. Tankless heaters can be paired with solar systems for optimal energy savings. 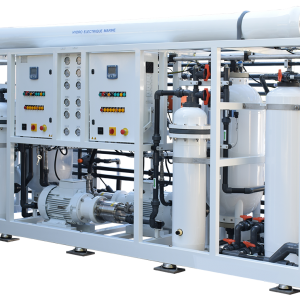 A marriage of these to systems is considered one of the most environmentally-friendly methods available. Solar tanks can store heated water from their collectors, which can be used by the home tankless unit. The solar component will have a large up-front cost. A solar heater costs about $2,000-$6,000 to install. Prices are known to get as high as $13,000. These styles have some of the highest returns, however. First off, they will qualify for the 30% no-cap tax credit. For a $6,000 install, that’s $1,800 returned. Second, studies show that they reduce water heating expenses by 50%-80%. These brands produce the top-selling tankless models available. Each of them has their own way of approaching these products. Bradford White requires that their units be installed by qualified experts. They were established over a century ago, but they have a smaller slice of the industry pie because of this business model and their limited distribution. Eemax is a relatively new company. It was established only a few decades ago and, yet, is a current front-runner in both the residential and commercial industry. Takagi focuses only on tankless styles and their products can be some of the most expensive. These units don’t come with gallon capacities like conventional tanks. So how can consumers determine which one is right for them? For both gas and electric, the demand of water needed at one time, known as the flow rate, should be calculated. Regular water heaters cost an average of $1,000 compared to tankless ones at about $1,750. There are many advantages to tankless models, however, which make them worth the larger investment for homeowners. Some of the biggest selling points are their fast heating rate, energy savings and long-life expectancy. In these styles, the water is heated extremely fast. Depending on the gpm, it will produce continuously based on the consumer’s needs. This makes for much more efficient use. The energy savings on these units is much greater than regular ones. Because water heating accounts for almost 30 percent of a home’s energy bills, these units can cut costs by up to 50 percent. These savings amount to about $80-$100 annually. Future home buyers are likely to value a system that can run multiple units at once and deliver hot water continuously. As a bonus, these models last about 20 years and are easy to maintain. They are very small and can be put in places that won’t allow conventional tanks. The average size is about 28 inches tall by 20 inches wide and 10 inches deep. Just as there are benefits, these units also have a few pitfalls. Their initial investment price can be prohibitive, their temperatures aren’t always reliable, and they won’t work in a power outage. The initial cost of the purchase and installation is much higher than that of a tank. Even with energy bill savings, it will take about 20 years, which is the lifespan of the product, for consumers to make up the initial investment. Another con is inconsistent temperatures. Customers say that faucets do not produce an instant hot water flow as they expected and that this feature resembles conventional tanks. During power outages, these models will not work. Unlike conventional styles, there is no backup water source in emergency situations. Consumers who have hard water must install a softener to their tankless unit to avoid problems that can occur from calcium buildup. The life of the equipment can be greatly shortened if it is not annually maintained. This is not a project for the average DIY homeowner. Many homes must be adapted to accommodate this system, which could require new wiring or gas lines, new piping and fittings, and possibly drywall reconstruction. Some localities require that this work be performed by a qualified professional. This is because of codes involving carbon monoxide emissions, thermal resistance, venting, and area-specific codes like earthquake straps in California. Hiring an experienced plumber is the best route to go to ensure that you meet all the coding and permit requirements. They can even make sure that you get the right equipment for your home. It would be unfortunate to find that you’ve purchased an incompatible heater after the fact. 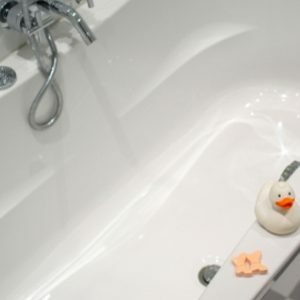 Going with a professional guarantees quick and accurate work, so that your home isn’t running on cold water while you wait for a plumbing permit. Are tankless water heaters worth the cost? The way the math works, these models have a long payback period. They are projected to last 20 years, yet it will take about 20 years for your energy savings to equal the initial investment. Therefore, the value of these models depends on how useful they are to you and whether they will appeal to future home buyers. You can sharpen the returns on your investment by choosing the right model for your consumption needs. Are tankless hot water heaters better? 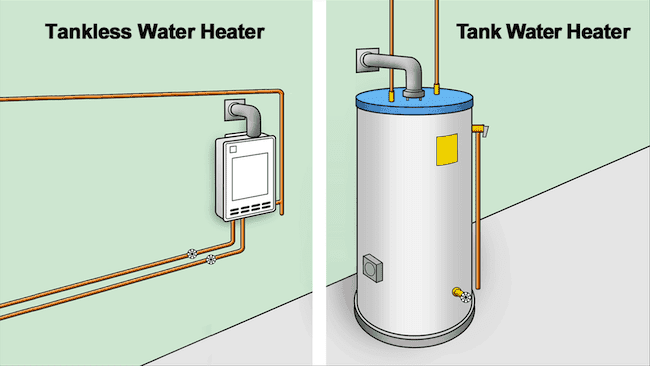 Tankless hot water heaters are better than conventional models in several ways. They conserve water by heating as they go and they can lower home energy costs. And they will also last longer and require less maintenance, as they are not storing water which can corrode tank materials and cause leaks. Do tankless hot water heaters work without electricity? These units will not work if there is power outage. Even gas models require electricity to control their spark igniter. What temperature should you set a tankless water heater? The Consumer Product Safety Commission recommends 120 degrees for optimal safety and efficiency. Do not set your unit to a temperature greater than 140 degrees. What is the best rated tankless water heater? Rheem and EcoSmart are two highly-rated brands. However, the industry is constantly evolving, and each home and family will have different needs. It’s best to consult a professional about which is right for you. How much water does a 20-minute shower use? An average shower demands 2.5 gallons per minute, which puts a 20-minute shower at 50-60 gallons. These water heaters can typically produce 4-8 gallons of hot water per minute. PLUMBING SERVICE WITH TALON PLUMBING.